While not American in nationality, Antonín Dvořák represented much of what American music was about. Specifically, he saw the value of early African-American and Native American music as rich sources to establish an American national identity. 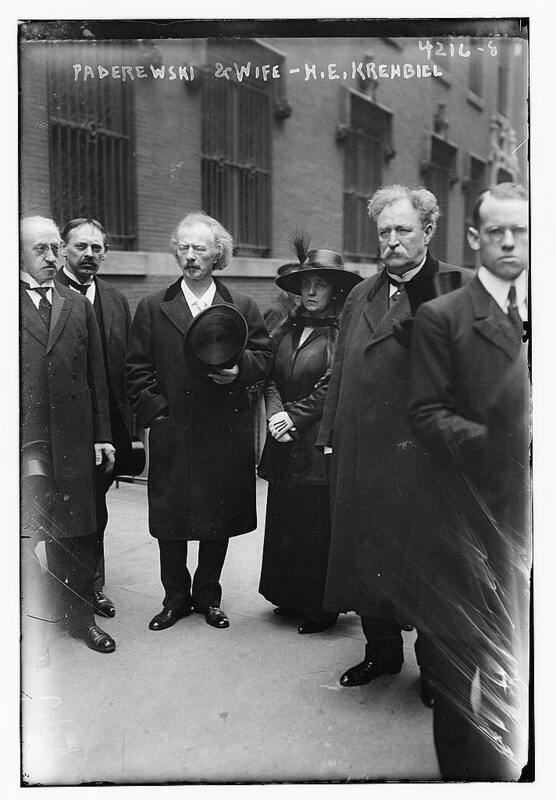 Dvořák spent time in America from 1892 to 1895 as the director of the National Conservatory of Music in New York. During this time, many Americans wrote letters to Dvořák. Of interest to me are two correspondences to Dvořák from Jan Josef Kovařík, the father of Dvořák’s secretary. Kovařík lived in Spillville, Iowa, where Dvořák spent some time in the summer of 1893. Both letters mention not his music, but instead offer a look into how Dvořák was treated by people of the towns he visited. The first letter was sent in May of 1893 before Dvořák’s arrival. In it, Dvořák is treated very cordially, and welcome with open arms. Clearly, Kovařík saw value in having Dvořák visit Spillville, and wanted to ensure a pleasant stay. This one instance shows that Dvořák was not viewed as an imposter or someone swooping down to bring up a “lesser” culture. He was merely a visitor to a small town, and his host treated him with kindness and a certain level of familiarity. The second letter was sent in December of 1894, well over a year after Dvořák had left Spillville. Kovařík seems to lament the fact the no one writes to him. 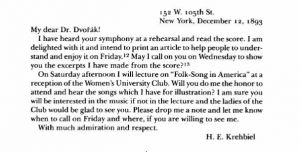 He opens the letter by stating that “In vain I have been waiting to hear from you.” Despite not receiving responses from Dvořák, Kovařík continues in a friendly tone. He discusses the town’s going-ons as in a normal conversation. Again, neither of these letters mention Dvořák’s music. However I think they still provide a valuable insight into how Dvořák was viewed as a person both before and after meeting someone. It seems that he left a positive mark on Spillville, and was gracious with his time while he was there. That speaks well to the music he might have gathered from the community there, as well as to his intentions in other areas of America. Klaus Döge. “Dvořák, Antonín.” Grove Music Online. 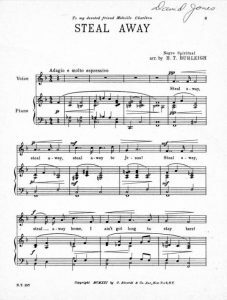 Oxford Music Online. Oxford University Press, accessed November 6, 2017, http://www.oxfordmusiconline.com/subscriber/article/grove/music/51222. “Letters from Dvořák’s American Period: A Selection of Unpublished Correspondence Received by Dvořák in the United States.” In Dvorak and His World, edited by Beckerman Michael, 192-210. Princeton University Press, 1993. In DvorÃjk and His World, Michael Beckerman collections of various correspondents between Dvořák and critics and fan. I found one letter that stood out to me in particular was from Henry Edward Krehbiel. He was writing with praise of Dvořák’s New World Symphony. We know from Simon Plum’s blog post titled Henry Edward Krehbiel published on October 10th, 2017. We know from Simon’s post that Krehbiel was a musicologist and author known for his work on bringing black folk music into the spotlight to be recognized. 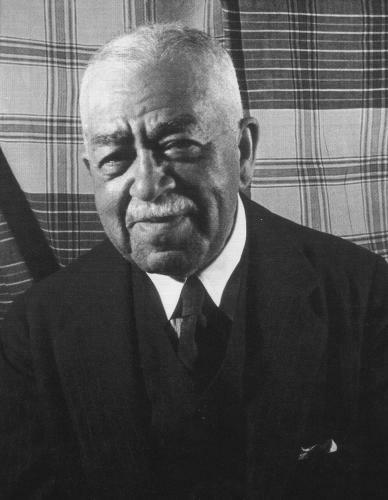 He was born on March 10, 1854 in Ann Arbor and passed March 20, 1923. Correspondance from H.E. Krehbiel to A. Dvorak. From Berkerman’s collection. 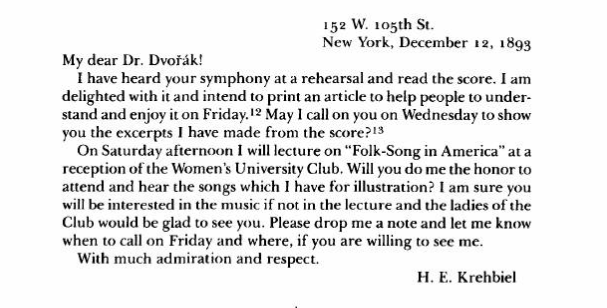 In this letter, composed by Krehbiel on December 12th 1893 in New York invited Dvorak to attend a lecture he was giving at the “Women’s University Club” on “Folk Songs in America”. Krehbiel wanted to talk with Dvořák about his New World Symphony to write an article on it for the New York Tribune. After doing some additional research, I was able to find a newspaper article published 5 days later after the correspondence. While there is no author listed, it fits the style and time frame of Krehbiel. It is a short article titled Dr. Dvorak’s Symphony located under the Music header of the Tribune. Bain News Service, Publisher. 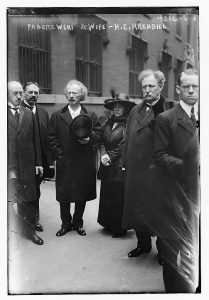 Paderewski & wife and H.E. Krehbiel . Photograph. Retrieved from the Library of Congress, link. Beckerman Michael, DvorÃjk and His World. Princeton University Press. Princeton, New Jersey. 1993. Plum Simon, Henry Edward Krehbiel. 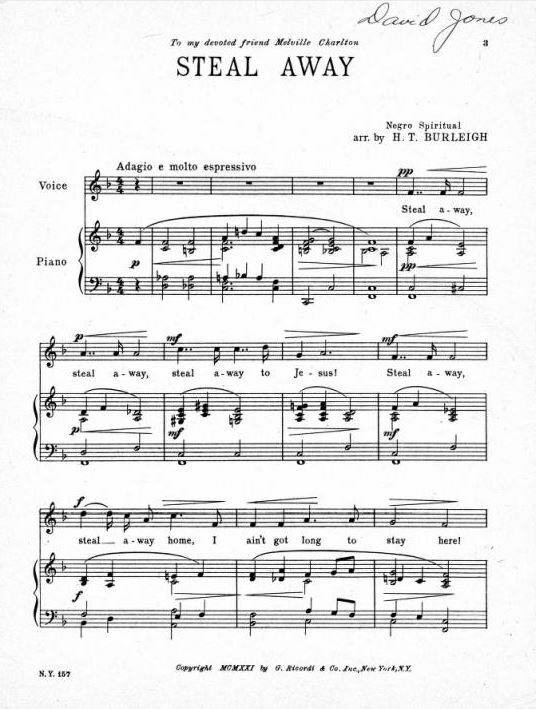 Music 345: Race, Identity and Representation in American Music. Pages.StOlaf. link.